As per the records available and best of our knowledge, Ahmedabad Medical Association is an oldest medical association of India and also one of the oldest medical association of the world. Membership strength wise also, it has the biggest number of membership. As on 1-7-2012 it has 7000 members on records. One hundred and five years old Ahmedabad Medical Association, though had a modest beginning, has a glorious past. The scintillating glory of Ahmedabad Medical Association that we see today is because of painstaking efforts by our past presidents. They laid down the foundation stone so deep and cemented so strong that it is recon as a force in the entire medical fraternity. Dr. S. K. Mallik, the founder of National Medical College, Calcutta visited Ahmedabad and stressed upon importance of professional. Established on 24th March 1902, the Ahmedabad Medical Association was initially named as Ahmedabad Medical Society, (AMS) and only handful of doctors were its members. Lt. J.W.T. Anderson was the founder president and Dr. Joseph Benjamin was hon. Secretary. Dr. S. K. Mallik, founder of National Medical College, Calcutta, visited Ahmedabad in 1902 and emphasized the need of a professional organization to promote brotherhood, to help in exchange of knowledge and to protect the rights of members. Taking inspiration from his talk, Dr. J.W.T. Anderson and others initiated the formation of Ahmedabad Medical Society or AMS (AMS was renamed as Ahmedabad Medical Association or AMA in 1976-’77). AMS is reported to have been started on 24th March, 1902, with just a few member on roll. Dr. (Lt.Col.) J.W.T. Anderson, the Civil surgeon was the founder president and Dr. Joseph Benjamin was the founder secretary. (GB-AISASA) – an association of paid surgeons and in Gujarat Branch of All India Medical Licentiates’ Association (GB-AIMLA). Ahmedabad Medical Society, initially started its functioning in a rental premises at Himabhai Institute in Bhadra upto 1922 and later on shifted to Prathana Samaj Mandir, near Raikhad. The foundation of its own building, near Mithakhali railway crossing, off Ashram Road was laid in 1957 and on 9-9-1962 at 4.00 p.m. the then Central health Minister hon. Dr. Shushila Nair opened the building. The building was later on given the name AMA House. Then it got renovated time to time.Last renovation was done in the year 2002-2003. 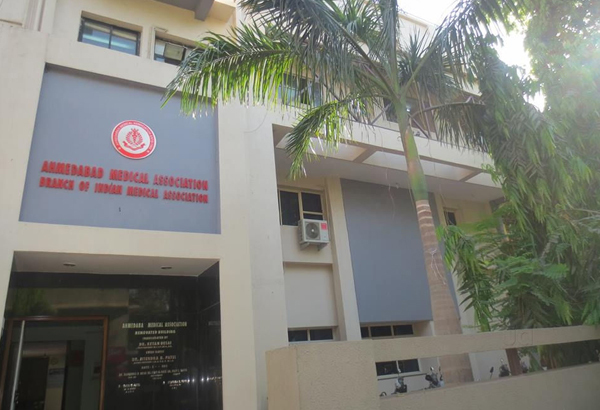 In 1928, the Indian Medical Association (IMA) was formed and in 1939 Ahmedabad Medical Society joined IMA – as one of its branches, when the revised constitute was adopted on 14-6-1977, the name of Ahmedabad Medical Society was changed to the Ahmedabad Medical Association (AMA). A Ladies wing – Ladies club of AMA, was formed and was inaugurated on 12-2-1966 by IMA hon. Secretary, Dr. Bhatala. Mrs. Chandraben Jayant Haribhakti was the first president of AMA Ladies club. Rules committee prepared the rules for Ladies club and were approved by the Managing Committee. This Association is doing multi-faceted activities. - Ahmedabad Medical Association President’s Relief fund for natural calamities. - Shri C. H. Bhagat Oxygen Centre. - Bai Mahalaxmi Oxygen Centre. - Shri PPR Shah Immunization Centre. - Dr. J. B. Haribhakti Medicare Centre. - Dr. S. C. Mahadevia Medical Relief Fund. - Dr. Tejas Patel Community service project. - “Aao Gaon Chale” project. - Smt. Kalpana & Jaydev Desai & friends community service medical camps (yearly). (it includes the list of all sports, ladies club activities, entertainment programmes like Drama, Dance, musical programmes & Vacation activities for children (Summer) etc. There are about ten regular sub-committees of Ahmedabad Medical Association, assisted the President, Hon. Secretary, office bearers and the managing committee in conducting the affairs of the Association. They are Scientific Committee, Sports& Entertainment Committee, Building Committee, Public Relation Committee, Library Committee, Rules Committee, Insurance Committee, Family Planning Committee, Benevolent Committee, Ethical Committee. (1) Guest House facilities: The Ahmedabad Medical Association and GSB IMA Guest House on 3rd floor since 15-7-1994. The President of Ahmedabad Medical Association inaugurated. (2) Every year Yoga Classes are arranged for members and their family members in winter season. (3) Independence day & Republic day are celebrated every year by Flag Hoisting, Bharat Mata Poojan & other celebrations like patriotic songs competition, debate competition and drawing competition for members and their family members.